Speed ZX-Four Galaxy S8 is a Quadruple Dual SIM card adapter for Android smartphones Samsung Galaxy S8. You install and use four SIM cards (nano SIM size) on your Samsung Galaxy S8 mobile phone. Once inserted into your phone, the SIMore menu appears automatically in your smartphone's main menu to manage your 4 telephone numbers and define your settings. Call, send and receive your SMS/MMS, access Internet/data with your 4 SIM cards on one and unique Galaxy S8. 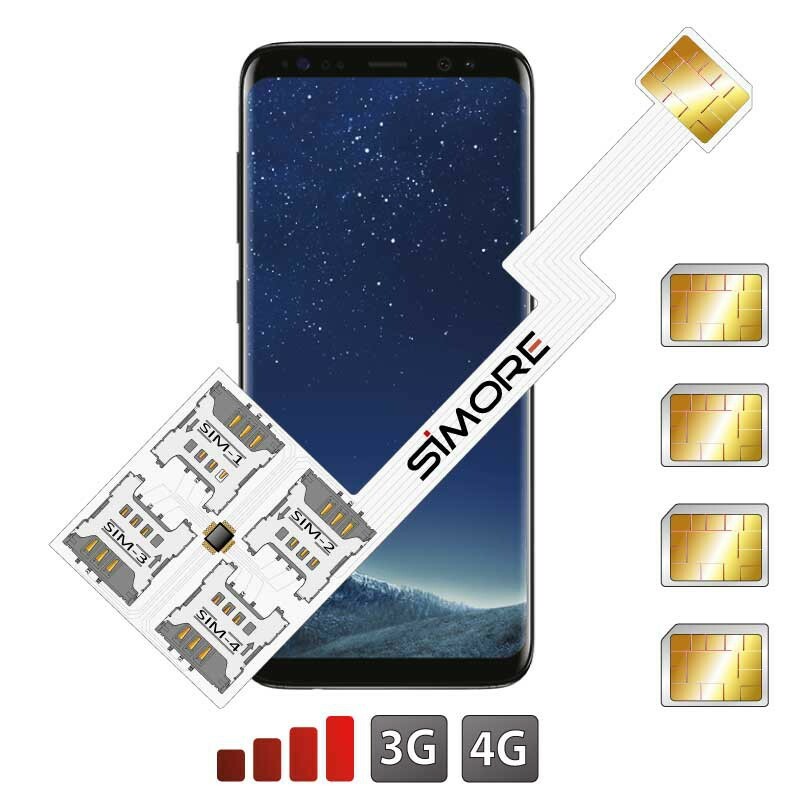 For Speed ZX-Four Galaxy S8 Quadruple multi SIM adapter, SIMore creates an innovative and unique design for a simple and easy installation. The device takes place directly into your smartphone slot and your 4 SIM cards slide into the four dedicated adapter's SIM slots. Together with the latest flexible printed circuit board technologies (Polyimide kapton) that ensure thinness and strength, the new Speed ZX-Four Galaxy S8 Multi dual SIM adapter design allows, in addition to reinforce the device's membrane, to secure a perfect connection between the SIM cards and your mobile phone. The Speed ZX-Four Galaxy S8 adapter includes the new Super Speed microprocessor that allows ultra fast switch between your 4 phone numbers. Its unique architecture optimizes the performance of the adapter and increases the execution speed of the SIMore menu's processes and applications. The Quadruple Dual SIM card adapter Speed ZX-Four Galaxy S8 includes the shortcut function. You can bring up the SIMore menu by dialling # 99, or switch between your four SIM cards (#11, #22, #33 and #44), directly via your Android smartphone keyboard. You can switch from one number to the other in two clicks and choose your SIM to make and receive calls, send and receive SMS, and access data and browse Internet. The Multi Quadruple SIM Speed ZX-Four Galaxy S8 adapter allows to name your SIM cards to know which phone number is connected and avoid roaming fees. Very convenient for travellers, businessmen, or anyone who uses more than one SIM or phone number (professional SIM , private SIM or foreign SIM). Integrate and use 4 phone numbers on your Samsung Galaxy S8 Android smartphone. Data and internet access through 4G LTE with 4 SIMs. Unique design, super thin and very resistant membrane. Perfect connection for optimized work. Super Speed microprocessor for ultra fast switch. Shortcut function for fast use. Choose to manually switch between your four SIM cards or set an automatic timed SIM switching.